You want to see your windows look pristine without squandering time, energy and much money? You can make this real now – just let the specialists of window cleaning in Camberwell deal with this task for you. We ensure that all parts of your windows are in perfect state – glass surfaces, framework and window ledges. You can be sure that your property is time for spare necessary. tasks this is not all – the In any case to chance will come to you escape chores with alongside many. We also provide our professional services in nearby areas: Denmark Hill, Brixton, Stockwell, Peckham, Nunhead. We use the most advanced techniques to make sure that you receive the best window cleaning. With our water-fed extension pole system and jet washing technique, you will enjoy perfectly clear look of your windows. We connect our poles to water reservoirs in our vans to make sure that there is no risk for the exterior of your home or business building. For higher windows, we employ fully secured rope access approach. You can use the advantage of these cleaning techniques now – just ring 020 3746 3113! Improve the look of your office – the experts of commercial window cleaning will deal with that. As part of our distinctive service, we use water-fed extension poles. With this method, we can clean completely the windows from outside of your office, as high as the fourth floor. To reach higher windows we use rope access. We grant your windows will look perfect, no matter the high of the building. With the assistance of the team of professionals London's skyline shall never be filthy. With our competence and technical excellence, you can rely on us for domestic and commercial window cleaning. Your house will look pristine after our services, regardless what kind of windows you have. We polish and wipe small, double or sash windows, French doors, bay windows and patio doors. In addition, we clean garden windows, skylights and greenhouses. In other words, you can rely on us for complete cleaning of your windows, including the framework and ledges. 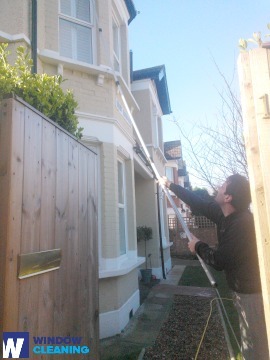 Book our prompt and reliable domestic window cleaning in Camberwell. We will clean the windows of your property in and outside. The solutions we use are safe - you will love the perfect results and make a green choice. Furthermore, we use only purified water. Don't hesitate, ring 020 3746 3113 and order our first-rate services. Our customer care staff will assist you – they are active 24/7. Another ways of booking – our request a cleaner online form or just chat with our representatives.